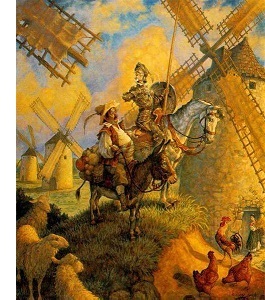 Don Quixote - Don Quixote is widely regarded as the first great novel of Western civilization. Before this, popular stories were generally written in verse and are referred to as epic poems (Beowulf, The Aeneid, The Iliad, etc.). Of course, there was an evolution from poem to novel, it didn't just happen overnight. Written by Miguel de Cervantes and published in two parts in 1605 and 1615, it follows the adventures of a man named Alonso Quixano who romanticizes about the era of chivalry, and pretends to be a brave knight roaming the countryside fighting dragons and giants; which in truth are nothing more than windmills. It is one of the most translated stories in the world and would have a tremendous impact on later adventure writers. Among them were Mark Twain (The Adventures of Huckleberry Finn) and Alexandre Dumas (The Three Musketeers). Cervantes himself was influenced by a number of earlier works such as Amadis de Gaula, Tirant lo Blanc and Orlando Furioso It is a classic tale of nostalgia, written shortly after Europe emerged from the Middle Ages when the standard sidearm was a sword, and transformed into an age when gunpowder ruled the battlefield.